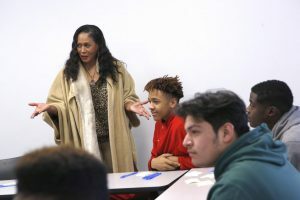 Delores White teaches a hospitality class for juniors at Dallas ISD’s Justin F. Kimball High School, and also runs the school’s four-year Academy of Hospitality and Tourism. Under her direction, the program has earned “distinguished” status from the National Academy Foundation. She says this program helped restore pride in Kimball. That’s after the state ranked the school academically unacceptable for five out of six years. The students are getting another boost, with several being fitted for suits that will help set them apart during interviews for internships and jobs. Read the full story from KERA here.